This study was performed to determine the correlation between psychiatric manifestations and several autoantibodies that might participate in the pathogenesis of psychiatric disorders in the course of systemic lupus erythematosus (SLE). Fifty-one unselected outpatients with SLE were enrolled. Psychiatric evaluation was performed according to the Diagnostic and Statistical Manual of Mental Disorders, 4th edition. The prevalence of antibodies against endothelial cells (AECA), cardiolipin, β2 glycoprotein I, Ro, Ro52, La, glial fibrillary acidic protein, ribosomal P protein, dsDNA, and nucleosomes was assessed by experimental and commercial enzyme-linked immunosorbent assays. According to the cutoff value, AECA were present in 11 of 17 (64.7%) SLE patients with psychosis and mood disorders and in 10 of 34 (29.4%) patients without psychiatric manifestations other than anxiety (P = 0.03). Moreover, the AECA binding index was significantly higher in the first group (P = 0.03). Conversely, no significant correlation was found between the presence of the other autoantibodies studied and psychiatric involvement. The results of this study suggest a relationship between AECA and psychosis and mood disorders in SLE, supporting the hypothesis of a biological origin of these disturbances. Systemic lupus erythematosus (SLE) is a chronic autoimmune disease characterized by multisystemic involvement with a broad spectrum of clinical manifestations. Neuropsychiatric SLE (NPSLE) includes neurological syndromes of the central, peripheral, and autonomic nervous system as well as the psychiatric syndromes observed in patients with SLE. These manifestations can precede the onset of SLE or occur at any time during the course of the disease. In 1999, the American College of Rheumatology (ACR) proposed a standard nomenclature for this condition, with case definitions for 19 neuropsychiatric syndromes associated with SLE . In the course of SLE, a variety of psychiatric disturbances are reported, including mood disorders (depressive symptoms), psychosis, and anxiety . The reported prevalence of psychiatric disorders in SLE varies widely, ranging from 17% to 75% [3, 4]. The diagnosis of psychiatric syndromes in SLE is difficult and depends on the exclusion of complications due to an iatrogenic effect of drugs, to metabolic abnormalities, or to infections [5–8]. Moreover, the diagnosis requires a careful psychiatric evaluation to exclude merely reactive psychological disturbances; in particular, anxiety may reflect a reactive process rather than a feature of NPSLE [1, 2, 9–11]. It has been suggested that several autoantibody specificities play a role in the pathogenesis of NPSLE. Potential pathogenic relevance has been attributed to, among others, antineuronal, antiphospholipid, antiganglioside, and anti-ribosomal P protein (anti-P) antibodies [reviewed ]. However, particularly regarding psychiatric syndromes, conflicting results have been reported on the association between serum autoantibodies and symptoms. For example, the association between serum antibodies to ribosomal P proteins and lupus psychosis has not always been confirmed and is still debated [13–18]. This high variability among different studies is probably related to differences in the populations of patients studied and the laboratory tests used to detect serum autoantibodies. The aim of our study was to determine the correlation of psychiatric manifestations and several autoantibodies (those against endothelial cells, cardiolipin (CL), β2 glycoproteinI (β2-GPI), Ro, La, glial fibrillary acidic protein (GFAP), ribosomal P protein, dsDNA, and nucleosomes) that might participate in the pathogenesis of psychiatric disorders in the course of SLE. This study included 51 unselected outpatients with SLE (44 women, 7 men; mean age 36.8 years, range 22–54 years; mean disease duration 9.4 years, range 0.5–26 years) attending the Rheumatology Division of the University of Rome 'La Sapienza'. All patients fulfilled the ACR revised criteria for the classification of SLE . Informed consent was obtained from each patient and the local ethics committee approved the study protocol. A blood sample was taken from each patient and was stored at -20°C until assay. Psychiatric diagnosis was assigned in accordance with the Diagnostic and Statistical Manual of Mental Disorders, 4th edition (DSM-IV) . The Structured Clinical Interview for DSM-IV axis I Disorders  was administered to all patients by the same psychiatrist. Patients were categorized in group A or B on the basis of clinical psychiatric examination. Those with more severe psychopathology such as psychosis and mood disorders (recurrent major depressive disorder, dysthymic disorder, or depressive disorder not otherwise specified) were included in group A. Group B included patients without psychiatric manifestations other than anxiety. We did not include in group A patients with anxiety disturbance alone because in most SLE patients anxiety is considered a secondary stress reaction and not a direct manifestation of NPSLE [1, 2, 9–11]. Current SLE disease activity was measured using the SLE Disease Activity Index (SLEDAI) . The rheumatologist responsible for assessment of SLEDAI was blind to the psychiatric evaluation. Human umbilical-vein endothelial cells were isolated by collagenase perfusion from normal-term umbilical cord veins as previously described  and were cultured in M199 medium (Sigma Chemical Co, St. Louis, MO, USA) supplemented with 20% FCS. These cells (third to fourth passage) were used to detect anti-endothelial-cell antibodies (AECA) of IgG isotype using a cell-surface ELISA on living cells allowed to grow to confluence in microtiter plates. After three washes with Hank's balanced salt solution (HBSS), nonspecific binding sites were blocked for 2 hours at room temperature with 3% bovine serum albumin/HBSS. After two washes with HBSS, the wells were incubated in duplicate with 100 μl of the sera diluted 1:50 in HBSS for 2 hours at room temperature. After three washes with HBSS, the bound antibodies were detected with alkaline-phosphatase-conjugated goat antibodies antihuman IgG (Sigma), using 1 mg/ml p-nitrophenylphosphate. Optical density (OD) was measured at 405 nm wavelength and AECA were expressed as a binding index (BI), equal to 100 × (S-A)/(B-A), where S is the OD of the sample tested, A is the OD of a negative control, and B that of a positive reference serum. AECA were considered positive when the BI was higher than the cutoff value (mean + 2 SD of 66 healthy controls) corresponding to 50% of a positive reference serum from an SLE patient . Finally, we evaluated AECA IgG reactivity in a disease control group of 34 consecutive patients with systemic sclerosis (SSc) (32 women, 2 men; mean age 51.1 years, range 21–77; mean disease duration 9.5 years, range 1.2–35; 8 with diffuse SSc and 26 with limited SSc) attending the Rheumatology Division of the University of Rome 'La Sapienza'. The diagnosis of SSc was made in accordance with the criteria of the American Rheumatism Association . Human glial fibrillary acidic protein (GFAP) purified from human brain was purchased from Biogenesis (Poole, UK; BH 17 7 DA). GFAP at 5 μg/ml in carbonate-bicarbonate buffer (pH 9.6) was used to coat 96-well microtiter plates overnight at 4°C. After three washes with PBS, plates were blocked for 2 hours at room temperature with 3% FCS–0.05% Tween 20 in PBS. After four washes in 1% FCS–0.1% Tween 20 in PBS, plates were incubated for 1 hour at room temperature with sera of patients diluted 1/100 in 0.1% Tween 20 in PBS. Mouse monoclonal IgG1 anti-GFAP (Sigma) diluted 1/1000 in 0.1% Tween 20 in PBS was used as positive control. Subsequently, after four washes, plates were incubated for 1 hour at room temperature with alkaline phosphatase conjugated antihuman and antimouse IgG from goat and rabbit respectively (Sigma) diluted 1/1000 in 0.1% Tween 20 in PBS. After four washes, p-nitrophenylphosphate tablets in ethanolamine were used for the enzyme reaction. Plates were read at 405 nm wavelength and results were expressed as OD. All assays were performed in duplicate. Anti-GFAP assays were considered positive when OD was higher than the cutoff value (mean ± 3 SD of 44 healthy controls). Anti-Ro, anti-Ro52, anti-La, anti-CL, anti-P (P0, P1, P2), and anti-β2-GPI ELISA kits were obtained from Diamedix (Miami, FL, USA). Anti-dsDNA and anti-nucleosome antibodies were obtained from Orgentec Diagnostika (Mainz, Germany). ELISA was performed in accordance with the manufacturer's instructions. All assays were performed in duplicate. A positive control and several normal human sera were run in the same assay to confirm the specificity of the results. Qualitative differences between subgroups were analysed by the chi-squared and Fisher's exact tests. The Wilcoxon unpaired test was used to compare quantitative variables in different groups. Spearman's rank correlation coefficient was applied for calculation of the correlation between parallel variables in single patients. A P value less than 0.05 was considered statistically significant. The prevalence of psychiatric disturbances in our SLE patients was 3.9% (2 of 51) for psychosis, 29.4% (15 of 51) for mood disorders, and 31.4% (16 of 51) for anxiety. In Table 1, we report descriptive statistics and clinical data of SLE patients grouped as specified in the Patients section. Group A was composed of patients with more severe psychopathology, such as psychosis (two patients had a severe delusional paranoid disorder, 1 of them with the persecutory type and the other with the erotomanic type) or mood disorders. We identified 15 patients with mood disorders: 11 patients with a major depressive syndrome (5 with a moderate single episode and 6 with a moderate recurrent disturbance), 1 patient with dysthymic disorder of early onset, and 3 patients with depressive disorder not otherwise specified. Group B included patients without psychiatric manifestations other than anxiety. The two groups did not differ significantly in mean age, gender, disease duration, steroid dosage, disease activity, or neurological manifestations. aGroup A, patients with mood disorders and psychosis; group B, patients without psychiatric manifestations other than anxiety. Differences between the groups as measured by the chi-squared or Wilcoxon unpaired tests were not statistically significant. SLEDAI, systemic lupus erythematosus Disease Activity Index. The prevalence of the autoantibodies tested in our patients with SLE is summarized in Table 2. AECA IgG was present in 11 of 17 (64.7%) in group A and 10 of 34 (29.4%) in group B (P = 0.03). Moreover, AECA BI was significantly higher in group A (P = 0.03) (Fig. 1), even though we observed in group B four SLE patients with high AECA BI (>80%), without any correlation with the SLEDAI score. Finally, a significant difference between the AECA BI of both groups versus normal donors was observed (P < 0.0001). According to the cutoff value, AECA prevalence in SSc population was 14.7% (5 of 34) and the AECA BI was significantly higher in SSc patients than in healthy controls (P = 0.002) (Fig. 1). A significant difference between the AECA BI of group A and group B of SLE patients versus SSc patients was observed (P = 0.0002 and P = 0.01 respectively) (Fig. 1). aGroup A, patients with mood disorders and psychosis; group B, patients without psychiatric manifestations other than anxiety. bP = 0.03 on the χ2 test; differences between groups A and B in other comparisons were not statistically significant. cMeasured in 16 of 17 patients. AECA, anti-endothelial-cell antibodies; β2-GPI, β2 glycoprotein I; CL, cardiolipin; GFAP, glial fibrillar acidic protein; P, ribosomal P protein. Anti-endothelial-cell antibody serum levels in systemic lupus erythematosus (SLE) patients, systemic sclerosis (SSc) patients, and normal healthy donors. 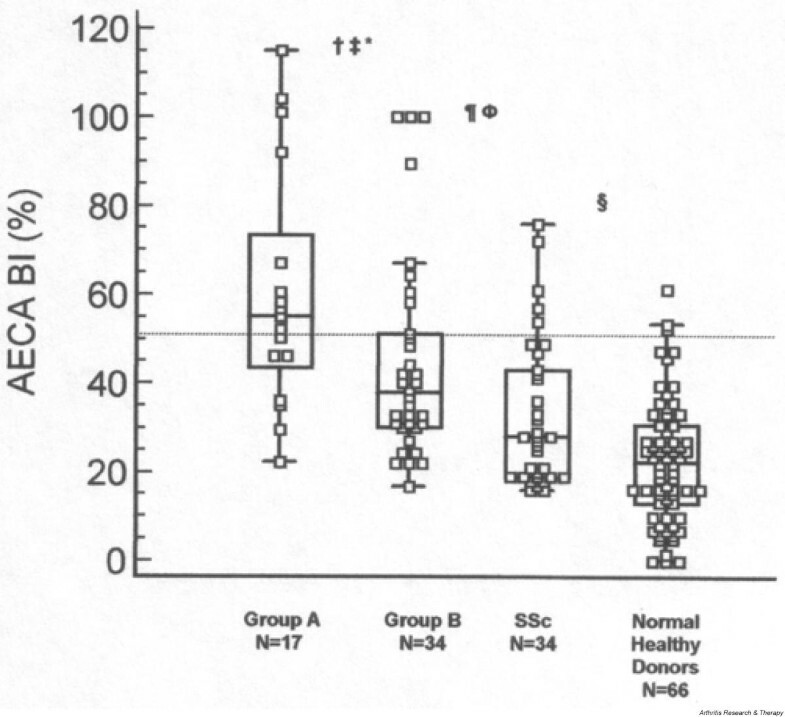 Box–whisker plot of anti-endothelial-cell antibodies (AECA) IgG binding index (BI) in SLE patients with psychosis and mood disorders (group A, n = 17), in SLE patients without psychiatric involvement other than anxiety (group B, n = 34), in SSc patients (n = 34), and in 66 normal healthy donors. AECA were expressed as a BI, equal to 100 × (S-A)/(B-A), where S is the optical density (OD) of the sample tested, A is the OD of a negative control, and B that of a positive reference serum. AECA were considered positive when the BI was higher than the cutoff value (mean + 2 SD for 66 healthy controls), corresponding to 50% of a positive reference serum from an SLE patient. Median, quartiles, range, and possibly extreme values are indicated. The broken line represents the cutoff. †, group A vs Group B, P = 0.03; ‡, group A vs SSc, P = 0.0002; *, group A vs normal healthy donors, P < 0.0001; ¶ group B vs SSc, P = 0.01; Φ, group B vs normal healthy donors, P < 0.0001; §, SSc vs normal healthy donors, P = 0.002. No significant correlation was found between anti-CL, anti-β2-GPI, anti-dsDNA, anti-Ro, anti-Ro52, anti-La, anti-P, anti-nucleosome, or anti-GFAP antibodies and the presence of psychiatric disorders. However, a higher prevalence, even though not significant, of anti-Ro52 in group A than in group B (35% vs 17%) was observed (see Table 2 for details). In our SLE patients, a significant correlation between AECA and anti-dsDNA antibodies was observed (P = 0.009). Interestingly, considering the two groups of patients separately, this association was detected only in group A (P = 0.03). No correlation between the autoantibodies tested and the other clinical features of SLE and SLEDAI was observed. This study provides the first evidence of an association between serum AECA and psychiatric disorders in patients with SLE. In 1999, the ACR nomenclature for NPSLE provides case definitions for 19 neuropsychiatric syndromes seen in SLE, with reporting standards and recommendations for laboratory and imaging tests . Regarding psychiatric disorders, the committee adopted the terminology of DSM-IV . Accordingly, in this study psychiatric diagnosis was assigned following the DSM-IV. In our series, mood disorders and psychosis were observed in 29.4% and 3.9% of patients, respectively. Mood disorders have been diagnosed frequently in SLE patients, with a prevalence ranging from 16% to 51%, whereas the reported prevalence of psychosis has varied from 2% to 7% [26–28]. Therefore, our estimation of the rates of psychiatric disorders corroborates the previous findings. Despite an overall impressive amount of investigations, the pathogenesis of NPSLE is poorly understood. Although a direct pathogenic role of autoantibodies in NPSLE through induction of neural dysfunction, vasculopathy, and coagulopathy has been suggested , the clinical association between autoantibodies, detected both in serum and cerebrospinal fluid, with NPSLE remains unclear. AECA antibodies are a group of heterogeneous antibodies that react with different endothelial-cell antigens. These autoantibodies have been detected in several autoimmune diseases and have been associated with nephritis and vasculitis in SLE patients . The proportion of AECA-positive sera ranges from 15% to 80% of cases in SLE, and recent data suggest their involvement in endothelial dysfunction and a pathogenic role of AECA in SLE [30–34]. Interestingly, some in vitro and in vivo reports have demonstrated an increased expression of adhesion molecules on human umbilical-vein endothelial cells, mediated by AECA IgG purified from sera of SLE patients [35–37]. Despite these findings, the role of AECA in NPSLE has not been fully investigated. Song and co-workers  showed the clinical association of AECA with disease activity in a cohort of 41 SLE patients. Interestingly, they described the association of AECA with NPSLE. Recently, Meroni and co-workers found AECA positivity in 5 of 14 SLE patients with involvement of the central nervous system (CNS) . The results of our study, demonstrating a significant association between AECA and psychiatric involvement in SLE patients, a feature not previously reported, strengthen the view of a possible implication of AECA in the development of NPSLE. On the other hand, we did not find any correlation between psychopathology and the other antibody specificities investigated. The relation between antiphospholipid antibodies and CNS involvement in SLE, first reported in 1984, has now been confirmed; thrombosis associated with these antibodies is considered the main pathogenic mechanism [40–43]. Moreover, antiphospholipid antibodies may contribute to neurological damage by reacting with brain cells by means of β2-GPI interactions. In this regard, we previously demonstrated the expression of β2-GPI mRNA by astrocytes, neuronal cells, and endothelial cells, suggesting that these cells can represent a target of autoantibodies in the antiphospholipid antibody syndrome [44, 45]. Since it has been postulated that AECA reactivity may be due in part to the binding to a complex of β2-GPI with phospholipids on endothelial cells [32, 33], we evaluated anti-β2-GPI and anti-CL antibodies by means of ELISA. No significant associations were found between these autoantibodies and AECA reactivity. Conversely, in line with previous reports [46–48], we found a significant correlation between AECA reactivity and anti-dsDNA antibodies in SLE patients. Interestingly, when the two groups of patients were considered separately, this correlation was detected only in those with mood disorders or psychosis. The prevalence of anti-P antibodies in SLE patients ranges from 6% to 36% , presenting ethnic differences. Moreover, a close association between lupus psychosis and the presence of anti-P antibodies has been described [13, 15–17], and serum levels of these antibodies decrease after successful treatment . In contrast, other researchers did not find any significant correlation between anti-P antibodies and NPSLE including psychosis [18, 50]. Yoshio and colleagues suggested that in SLE patients there is a strong association of IgG and IgM antiribosomal P0 protein antibodies with CNS disease, excluding lupus psychosis . Interestingly, the ribosomal P protein P0 has been identified by molecular cloning strategy as an endothelial autoantigen in SLE patients . In the present study, we estimated a prevalence of 7.8% for anti-P antibodies in SLE patients without any association with either psychiatric disturbance or AECA reactivity. Remarkably, in our series the two patients with lupus psychosis were both seronegative for this autoantibody specificity. This variability among different studies was probably related to the differences in selection of NPSLE patients as well as to the laboratory methods used to detect anti-P autoantibodies. A high positive predictive value of anti-GFAP antibodies for NPSLE has been described . The intermediate filament protein of astrocytes, GFAP, is up-regulated in gliotic hypertrophy and perivascular inflammation of Alzheimer's disease and multiple sclerosis where anti-GFAP antibodies were also described [54–56]. Recently, Trysberg and co-workers  showed increased levels of GFAP in the cerebrospinal fluid of patients with NPSLE. Moreover, successful therapy with cyclophosphamide in six NPSLE patients resulted in significantly decreased CSF levels of GFAP . In our cohort of SLE patients, we found an anti-GFAP prevalence of 15.7% without any correlation between anti-GFAP antibodies and psychiatric morbidity. Nevertheless, the exact role of anti-GFAP in the pathogenesis of NPSLE should be clarified by prospective studies with both intrathecal and serum determination. Finally, anxiety and depression are frequently detected in SLE patients and it has been suggested that these disorders are predominantly psychoreactive [10, 11]. However, in a large retrospective study, SLE patients with depression presented CNS involvement more often than patients without, supporting the view that mood disorders are not merely a response to stress . Our data demonstrating the presence of serum AECA in 60% of patients with depression and only in 25% of patients with anxiety alone support the hypothesis that depression in SLE could have a biological origin. This study provides evidence of an association between serum AECA and psychiatric disorders (i.e. psychosis and mood disturbances) in patients with SLE. Conversely, we could not demonstrate any correlation between psychopathology and the other antibody specificities investigated. The high prevalence of serum AECA in patients with psychosis and mood disorders supports the hypothesis of a biological origin of these disturbances.